Beta Marine supplies engines that match the Atomic 4 mounts in power ranging from 10 HP to 28 HP. Beta Marine is the only engine manufacturer dedicated to supplying diesel engine replacements for the Atomic 4 line of gas engines. If you have an old Atomic 4 gas engine, Beta Marine provides many of its engines with Atomic 4 mounts, at no additional charge. This makes installation simple and you get all the advantages of a diesel engine - no need to modify your engine beds or stringers. Engines available with Atomic 4 mounts include the 10 HP Beta10, 13.5 HP BZ482, 16 HP BZ602, 20 HP BD722, 25 HP BD902, and 28 HP BD1005. Give us a call and tell us your boat model, prop size and pitch, and current engine, and we will provide a quote on a drop-in replacement that will be quieter, more fuel efficient, more compact, and weigh less. Our toll free number is 888-792-BETA (2382). 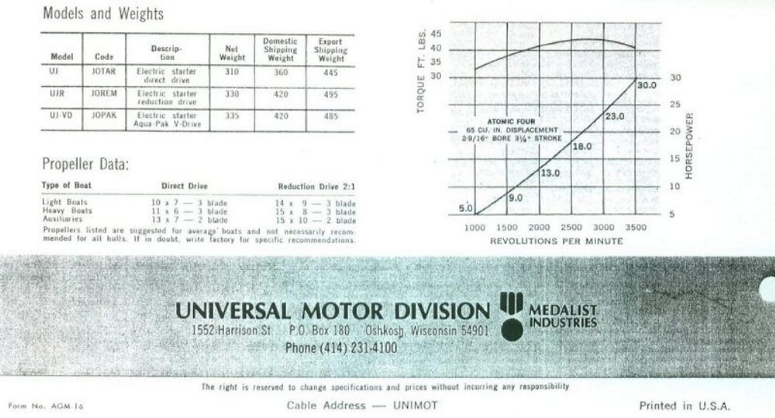 Here is a photocopy of a Universal Motor data sheet, showing information on the Atomic 4 Engine range.